These are two of my favorite words. I find myself thinking these words and saying these words many, many times throughout my day. 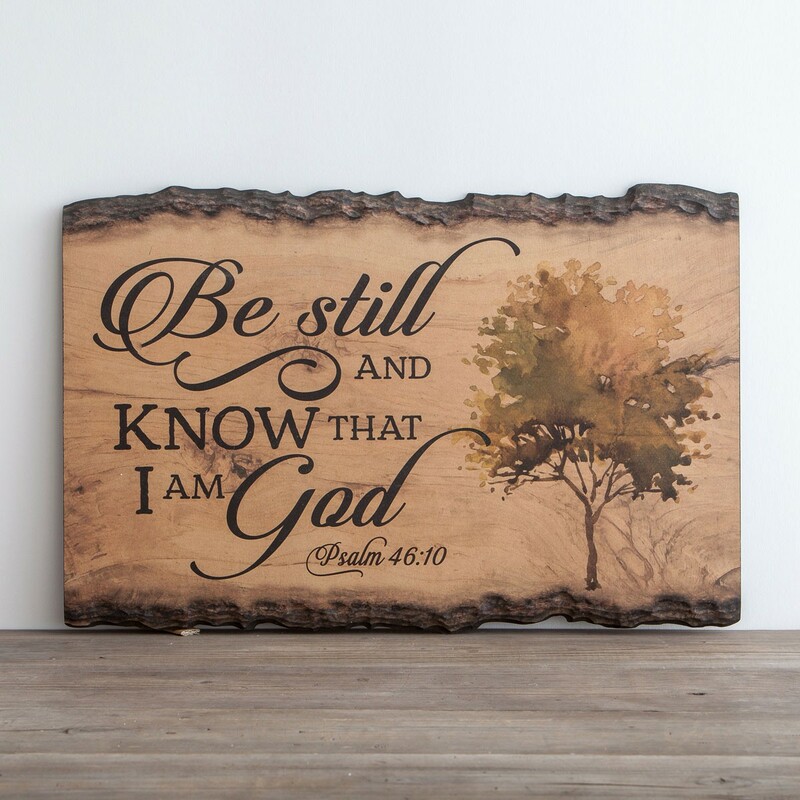 Many years ago, while going through a difficult situation, God gave me Psalm 46:10 to remind me that He was still in control and that I only needed to be still. I posted this verse in several places in my home because I often needed the reminder. Over the years the two words be still have become so much more to me. They've become a life goal. They've become my words. Our world is so full of noise and activity. We continually move from project to project, often in a hurry. We have the tv going, the radio playing, the computer on, the iPad, and cell phones. We wear ear buds to hear our devices and even to make calls. So. Much. Noise. Then we wonder why we can't hear from God. Sometimes we need to turn off the noise. We need to just be still. Sit quietly in His presence for a few moments. Listen intently for Him. When was the last time you turned off all of the noise, closed your eyes and just sat in His presence? This intimate time with our Father is important. He desires this time with us, to hold us, to whisper His love to us, to speak to us. Whether we realize it or not, our soul desires this time with Him too. This is my favorite spot in my home, where I come to be still before God. 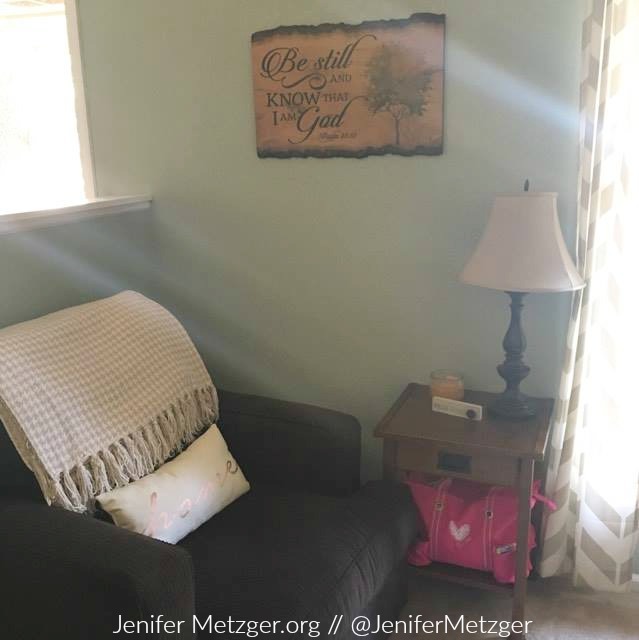 My pink bag holds all of my Bible study materials and my wall art from Dayspring reminds me to be still. I am a children's pastor. In my children's church we do a lot of jumping, dancing, playing and having fun. And we like our music loud. I began to realize the kids were having a hard time switching from fun and games and loud to worship. So we began to do a be still time. Right before our worship and sermon we turn all of the music off, we lower the lights and for 60 seconds there is no talking, no moving, no playing, nothing. We sit still in the presence of God. Then our worship music begins and the kids have now been still with God and feel more calm and open to worship Him. This has made a world of difference in our services. It's made a world of difference in me. Friend, may I encourage you to begin an intentional practice of being still in His presence every single day? Make this a priority. Teach your children to be still in His presence. I promise you, they will understand and it will begin to transform their own relationship with God. Let be still become part of your own daily routine and part of your own heart. This Be Still wall art by Dayspring is one of my favorite pieces in my home. It is 24"l x 16"w x 1/2"d, made of wood composite, and was made in the USA. Dayspring offers many beautiful pieces for your home, office, as a gift and for your holiday celebrations. Right now they are offering $20 OFF any purchase of $60 with the code SHINEHISLIGHT. And as always, all orders over $50 get free shipping. That is a generous deal! This is a great time to pick up a new piece for your home before Thanksgiving or to begin your Christmas shopping. To head over to Dayspring, click HERE or click the image below. it is hard to imagine that this is the first comment to your beautiful text. Friday I was explaining the quiet and still. Oh how I love the quiet at home when I can hear ceiling fans in other rooms, knowing others are sleeping soundly, without noise. Often visiting Dad or Mom, we did not talk much, rather ate or watched tv together. Mom and I often discussed scripture, but Dad and I were often silent as he watched westerns or sports such as wrestling, football or fishing. Frequently there were outbursts of criticism or laughter over something silly or ridiculous. Sometimes there was a project, like when we harvested from Dad's home garden in season. Most often there was simple presence. With an active mind wanting to DO something, I sometimes left disappointed that I hadn't really spent "quality time" with them. Mom had said that she was glad to see me and that we didn't have to do anything. Apologizing one time, I was stunned by Dad's response that he knew that we were busy with life and sometimes nothing is needed to say or do, adding that we think about each other even when we are apart. So it is with prayer, like Mary, just sit at His feet, present and still. She was listening to Him. Sometimes it is good to listen to your beloved's heartbeat and breathing. 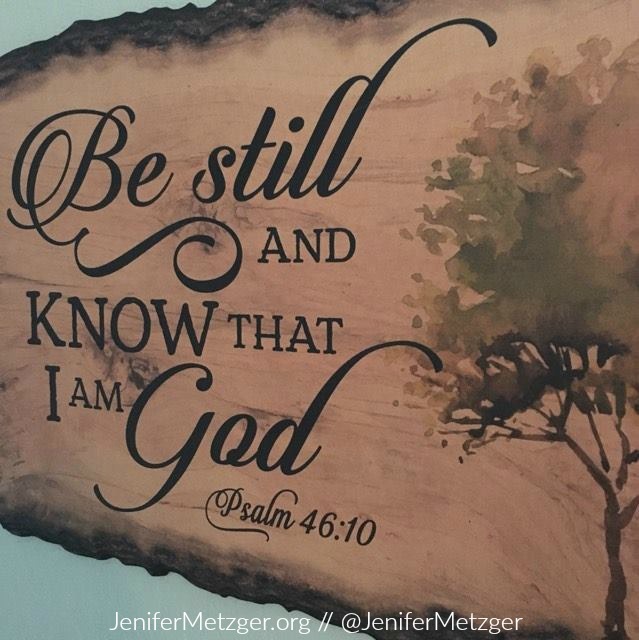 The psalm that instructs us to "be still and know," is simple. We tend to think and talk and do things. Being still, truly still, and simply knowing that He is God, takes some dedication to simply being. We are awed by God. He said He will be exalted. Be still and know. It takes me to the precious times with my wife, children, Mom or Dad or a friend, when we just sat together, being together. I can remember being together in a timeless and event-less moment. Nothing else mattered. There is great power in simply being. Thank you for sharing. I love how you say, "Sometimes it is good to listen to your beloved's heartbeat and breathing." That is a beautiful way to say it. God bless! Thanks for sharing this post. I was just talking to my husband about how sometimes I'd like to be him because he can just sit and do nothing, while I feel guilty if I'm not doing something. I think I needed to hear this post to be reminded that I need to be still in the mornings with God before I start my day.